Luxurious style with a handcrafted look that rivals fine custom racking, at a price that only a modular kit could offer. Every component is available in classic finishes with the look and quality that will last a lifetime. Luxurious style with a handcrafted look that rivals fine custom racking, at a price that only a modular kit could offer. Every component is available in classic finishes with the look and quality that will last a lifetime. 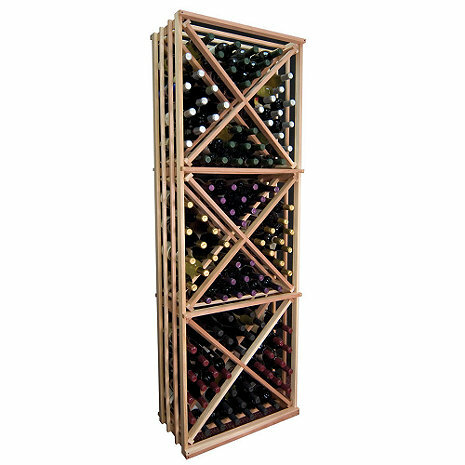 Full-depth racking-measuring 13-1/2" deep-that completely supports a standard bottle of Burgundy or Bordeaux along its entire length. Custom details like beveled rails, eased edges and face trim on the Solid Diamond Cube and Bin. Custom design elements such as the Quarter Round Shelf Cabinet, Vertical Display Cabinet and Waterfall that have never been offered in a kit before. Curved corners offered with or without 15 degree bottle display. Open Diamond Cube - Size: 72"H x 24-3/16"W x 13-1/2"D - Made in the U.S.A.
BEST ANSWER: Hello, thank you for your question. This rack is 72" in height, 24-3/16" wide, and 13-1/2" in depth. Thanks again. what is the bottle capacity of this rack? BEST ANSWER: Thank you for your question. This rack holds 132 bottles. Having problems with bulk wine bottle storage? Wine Enthusiast's Designer Wine Rack Kit – Open Diamond Cube is the answer you've been searching for. For a little over $200, this wine rack is a great buy because it can kill two birds with one stone. How so? First off, while it is similar to solid diamond bins, this option is more economical since it utilizes an open construction concept of 1x2's slats which does not include face trim. The result is a more affordable wine racking option that enables us to save on cost without compromising the integrity of the rack. Each of the 4 section of one cube can hold approximately 10 bottles, and since it's only 1 column wide x 3 cubes high, it doesn't take up much space. Second, this wine rack is no slouch when it comes to style, either. Made from the best quality Redwood, it can easily be dressed up with the broad range of stain options and custom finishes available here at Wine Enthusiast. Plus, the racks come with finishing nails making for easy assembly. On a side note, if you're a complete novice at the wine cellar game, we recommend using a brad nailer for faster assembly AND getting someone who has enough experience to help you out. Having problems with bulk wine bottle storage? Wine Enthusiast's Designer Wine Rack Kit – Open Diamond Cube is the answer you've been searching for. For a little over $200, this wine rack is a great buy because it can kill two birds with one stone. How so? First off, while it is similar to solid diamond bins, this option is more economical since it utilizes an open construction concept of 1x2's slats which does not include face trim. The result is a more affordable wine racking option that enables us to save on cost without compromising the integrity of the rack. Each of the 4 section of one cube can hold approximately 10 bottles, and since it's only 1 column wide x 3 cubes high, it doesn't take up much space. Second, this wine rack is no slouch when it comes to style, either. Made from the best quality Redwood, it can easily be dressed up with the broad range of stain options and custom finishes available here at Wine Enthusiast. Plus, the racks come with finishing nails making for easy assembly. On a side note, if you're a complete novice at the wine cellar game, we recommend using a brad nailer for faster assembly AND getting someone who has enough experience to help you out. If you are looking for cost effective, bulk wine storage in a location that doesn't have to make a decorating statement, then this is a good alternative. Assembling it correctly is a challenge - the instructions are poor, and the soft wood & nails require basic carpentry skills to do it without splintering components. The bottom line is if you want a down and dirty solution that is inexpensive, this fits the bill - but after buying this, the adage, "you get what you pay for" seems to hold true - There is a reason other racks costs much more.